"World's First" home-use seven needle embroidery machine with a 5.7" Remote Computer Screen. With 50 built-in embroidery designs and 10 fonts for monogramming, a USB port to easily import designs and a maximum speed of 800 SPM, the possibilities are endless. All embroidery operations are noticeably faster and smoother on the MB7. You will be impressed with your project's professional-finished results. Maximum embroidery size 9.4"x 7.9". 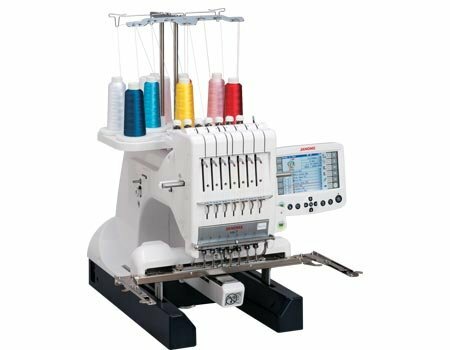 Features: Extra Large Bobbin, 6 LED lamps, programmable jump-thread trimming, flexible stitch traveling, independent bobbin winder, stitch-out time indicator.